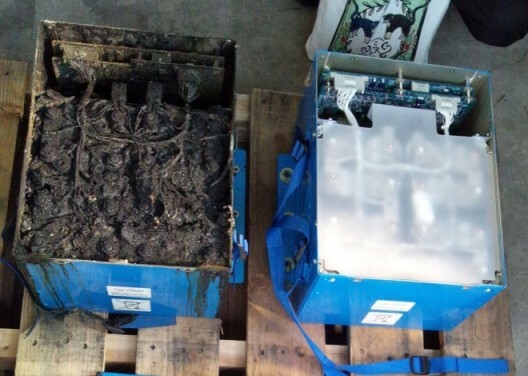 Blog A Fix for Dreamliner Battery Woes? With Boeing facing financial doldrums because of its ongoing grounding and resulting slump in sales of the 787 Dreamliner, the stakes are high for the company. That makes today’s Reuters’ report that the manufacturing giant may have found a “way to fix battery problems on its grounded 787 Dreamliner jets” good news for not only Boeing, but for electric aircraft in general. Readers should read these findings with some caution, though, since another report from Japan gives a different possible cause for the problems. That said, the two reports might not be mutually exclusive. Many electric light aircraft developers use spacing between cells and some method to circulate cooling air over them. 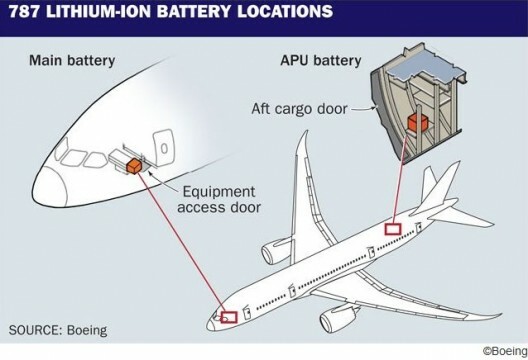 In Boeing’s two 787 lithium battery packs, eight large cells fill a fairly tight housing. Reuters quotes an anonymous source, “’The gaps between cells will be bigger. I think that’s why there was overheating,’ said the source, who declined to be identified because the plans are private. “A spokeswoman from the U.S. National Transportation Board declined comment on the report or any Boeing plan to return the 787s to the air. “A spokeswoman from the U.S. Federal Aviation Administration declined to comment…. King 5 Television in Boeing’s Seattle home gives another possibility, as it reports on findings by Japan’s Transport Ministry. “Meanwhile, a probe into the overheating of a lithium ion battery in an All Nippon Airways 787 found it was improperly wired, Japan’s Transport Ministry said Wednesday. NOTE: Thomas Boyle, a well-informed reader, sends the following explanation: “‘Valve’ is a now-antiquated term in electrical engineering. In modern terminology it would be a ‘diode’. A diode is a device that allows electrical current to flow through it in one direction, but blocks current from flowing in the opposite direction. The translator appears to have used the older term.” Our thanks to Mr. Boyle. “Flickering of the plane’s tail and wing lights after it landed and the fact the main battery was switched off led the investigators to conclude there was an abnormal current traveling from the APU due to miswiring. As noted above, either or both explanations could be true. Boeing uses two identical lithium ion battery packs, with cells made by the Japanese manufacturer Yusas and using a lithium cobalt chemistry. These packs replace or augment engine starting or other hydraulic systems. Electravia in France, with over 35 different electric aircraft flying, and others in the U. S. and Slovenia use similar chemistries. Randall Fishman uses lithium polymer cells in his ElectraFlyer craft, but with flow-through cooling which moderates temperatures and vents any products of overheating – an unlikely event because of the low-discharge way Randall pulls current from his battery packs. None of these manufacturers have reported battery problems that would lead to an emergency landing. She said there have been no issues with the Kokam cells her firm uses, and that PCM (circuit protection modules) and BMS (battery management systems) help ensure safe running. It is critical for Boeing to resolve this issue, since it has 50 Dreamliners cooling their wheel wells and no incoming cash flow even though it is producing aircraft daily. Maybe they’ll find ideas from small electric aircraft. “Valve” is a now-antiquated term in electrical engineering. In modern terminology it would be a “diode”. A diode is a device that allows electrical current to flow through it in one direction, but blocks current from flowing in the opposite direction. The translator appears to have used the older term.